What is happening to the Starwood and Marriott UK credit cards? Over in the US, a major rebranding of the Marriott Rewards and Starwood Preferred Guest credit cards has been announced ahead of the launch of Marriott Bonvoy on 13th February. So, nothing to get excited about. The new Virgin Hotels chain is gearing up to open in San Francisco next month, following the successful launch of the first property in Chicago three years ago. It is a new-build property at 250 Fourth Street, South of Market. You can enter your Flying Club number during the booking process on the Virgin Hotels website. The Virgin Flying Club page which explains the benefits you get at Virgin Hotels is here. You cannot, at present, redeem miles for free nights at Virgin Hotels. Next up will be properties in Dallas and New York. The first site outside the US will be Edinburgh where Virgin Hotels is converting the historic India Buildings in the Old Town. The cheapest – and best value – 2,000 Avios package has already sold out. You were only paying €19 for 2,000 points, which is 0.84p each. OT again re :Marriott redemptions. Are points+cash redemptions no longer available as they were before the merger with SPG? I’m looking at redeeming at Turnberry. points and cash redemptions are definitely still available at SOME Marriott hotels. OT – sorry if this has already been mentioned and I’ve missed it. Just received an email from Curve (via Crashlytics) to test the Android app. Have others received this? I wasn’t in the original beta group, but did ask to be included in future ones. Just wanted to make sure this was all legit? That’s certainly who they use, but I’m in the beta so am used to the emails! Did you uninstall the existing version first? Signed up and working. Tried a £100 top up with my Plat card, and all worked fine. They have charged the 0.65% which I didn’t expect with it still technically being in beta. My 365 days is not up to start spending again until early March. I hope that they have sorted things out by then. All up and working although it did take a few attempts to get the app to launch properly and it wouldn’t accept the test validation charge amount at first. Just paid my HMRC bill which should trigger my 2-4-1 voucher so very pleased. Surely this is a massively easy way of hitting credit card bonus limits for a relatively small outlay of 0.65%? OT – Gatwick Grain Store. With Priority Pass from Amex Platinum, do I get £15, or £30 credit if I’m on my own? if you’re a pleasant cheery sort of person, exuding bonhomie, I believe £30 is fairly achievable – it helps them as well. Your other half could be on their way etc. £15 for the cardholder (you), but an additional £15 for a guest. O/T regarding Virgin Rewards credit card 241 benefit. I just called Virgin asking whether I could use flying club miles for 3 reward tickets and use the 241 for a fourth, rep said I needed to have one cash ticket. My Marriott ’29 ways to stay’ points posted a few weeks ago but these don’t seem to have reset the expiry date for my points. Was there ever a definitive answer to the question of whether these points counted as eligible activity or not? They don’t count as qualifying activity. Credit card spend or a stay does. OT – when does Curve Metal “go live”? I assume at the same time they will be allowing Amex on both the old curve cards as it says at the below link? We are days not weeks. Just add an Amex and top it up? There’s a button in the app below the card that says topup! You need to add the card and it will create an Amex wallet you can then top up. Is it safe to assume a Curve article coming tomorrow morning? I am tempted to apply for metal but not until I see full analysis. As others posted, don’t need insurance or lounge benefits, so in two minds. Not tomorrow, there are various media embargos in place. OT – What is the best sign up bonus for a company AMEX and can I self refer? None, if you already have a personal Membership Rewards earning Amex. Otherwise it is 45k for Plat. Can I just keep my old blue card (which is physically black) and pay the Amex 0.65% fee when putting my tax through to get my BAPP 241? I know Anna has asked something similar twice and no-one has got back to her. I’m in the same boat, I’d like to know this too. Quite a few of us have replied in various articles saying yes. OT: I need to get my hands on 40k Marriott points to complete a reward booking. What’s the best card to get (if any) for reward points if I already have Amex Gold and Platinum and have held Amex SPG in the last six months? 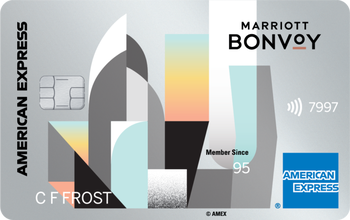 Amex MR is not the optimal way to get Marriott points but if you need the points desperately – I assume you have reached your 90k referral limit this year? Also consider asking partner/family member/very good friend to take out a SPG amex, which you use to spend (and pay back your trusting person) and transfer the sign up spend points to you. Thanks. I wasn’t sure if Marriott points could be transferred (I know Hilton points can) between members. What’s another way of earning Marriott points? This is for a booking in August that I’ve already secured at 100k points for 2 nights (I already have 60k points). I don’t stay often enough at a Marriott to get 40k through nights and Megabonuses. Sorry is this a trick question? August is more than 6 months away so you should be able to refer yourself for the SPG Amex again. I’m not aware of any other way to get 40k points quickly except buying them, but you would probably be better off doing 1 night redemption and 1 night paid. I think your only option is via referrals. If you could refer someone from plat to SPG and get them to spend £1k and transfer the Marriott points to you, that would get you 63k Marriott points I think. Alternatively 2 X referrals from plat to any other card would get you 54k Marriott. Thanks. Transferring Marriott points between members was a new one on me. People mentioning grandfathered black Curve card, has it been confirmed that you will get to keep the black card without paying a monthly fee or any other benefit? You’re almost ready to join Curve Amex Closed Beta Programme. Is this the same email that other have receined today? I’ve now completed the form but unclear as to what happens next, am I meant to be receiving a link next? If so how long after submitting the form does the link come through? You’ll probably next receive a ‘crashlytics’ email to register your device for the beta rel. How do we use the Curve Amex Wallet? I added £500 and it charged my Amex Card, just tried using the curve card online and it didn’t go through? If your balance is topped up and showing in the Curve app then should work fine. If having problems then I’d contact Curve support. If showing as pending on Amex then should have gone through. If it doesn’t show up in a couple of hours I’d contact support to try and work out what’s happening. I’d also try force closing and restarting the app.